Download this video clip and save to your computer. Open Logger Pro and insert the video. 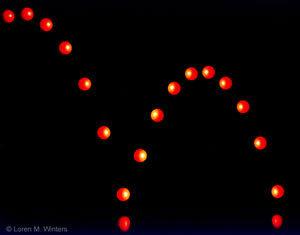 The motion does not appear smooth, because the ball was illuminated by a light flashing at a constant rate of 20.0 s-1. The table on which the ball bounces is not visible. However, the ball's reflection from the table can be seen when the ball is near the table. The table on which the ball bounces is horizontal. The plane of the ball's motion is vertical and is also parallel to the film plane of the camera. We assume that the vertical acceleration of the ball has a magnitude of 9.80 m/s2. The photographer ... shame on him ... forgot to record the diameter of the ball. Deduce the value of the diameter in meters as accurately as possible. In solving this problem, use what you already know about projectile motion to investigate the motion of the bouncing ball. At first glance, it will seem as if insufficient information is given, as the scale of the video is not given and the surface on which the ball bounces cannot be seen. Consider yourself a Physics detective for this problem and come up with a winning strategy. Develop a method for solving the problem. Carry out your method. Show all your work in Logger Pro. Label graphs clearly. Show how you determine the diameter of the ball.